Last week I was in beautiful Toronto, where I presented the keynote address and participated in a panel discussion at the annual Mines and Money conference. It was the first time the highly respected gathering of precious metals analysts and investors came to the Americas, and they couldn’t have chosen a better city than my hometown. Toronto has long served as a major hub for mining finance and is home to some of the world’s largest gold producers. Toronto is also one of the most multicultural municipalities on earth. According to its website, over 140 languages and dialects can be heard in the city, with a third of its population speaking a language other than English or French at home. This makes it an extremely attractive destination for professional millennials from all over the globe. I had the pleasure of attending a Young Presidents’ Organization (YPO) event in Toronto as well. The YPO is the world’s preeminent group for global business leaders and executives, providing peer-to-peer learning and networking opportunities among its 24,000 members. The companies they lead generate an impressive $6 trillion in global annual revenue. The daylong event, titled “Culture Shock,” focused on the societal effects of disruptive technology, including advanced robotics, 3D printing, the internet of things and more. While at the Mines and Money conference, the Mining Journal presented its Outstanding Achievement Awards. I’m humbled to share with you that Ralph Aldis and I were co-recipients of the Best Americas Based Fund Manager award. It’s a great honor to have been selected from among such an esteemed group of portfolio managers. The award symbolizes U.S. Global Investors’ strong commitment to its investors and shareholders. It’s my firm belief that we’ve consistently been a leader in the metals and mining space. I’m deeply proud of what we’ve managed to accomplish over the years, starting almost 30 years ago when I bought a controlling interest in the company. Since then, our funds have been recognized numerous times by Lipper and Morningstar, two trusted independent financial authorities. You’ve probably heard by now that, in an effort to lift oil prices, the Organization of Petroleum Exporting Countries (OPEC) tentatively agreed to a production cut at its meeting in Algiers last week. The cartel, which controls more than a third of world output, plans to limit daily production to between 32.5 million barrels and 33 million barrels, down from 33.2 million barrels. It’s important for investors not to get too excited over OPEC’s decision. At the moment, none of this is set in stone. Some OPEC members are already wavering, with Iraq questioning output numbers and Nigeria moving to boost production. Plus, American producers are likely to step into the void OPEC would create. Compared to last year, production is down only 535,000 barrels a day—and that’s with far fewer operating rigs. But it appears companies are eager to get back to work. 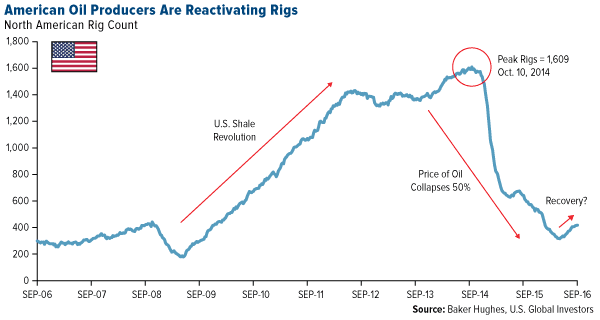 In 12 of the last 13 weeks, North American drillers reactivated mothballed rigs. I expect to see the pace rise as it becomes clearer OPEC will make good on its resolution. For the past two years, OPEC’s pump-at-will policies have flooded the market with cheap supply, causing economic pain for producers with higher cash costs, including those involved in fracking, the Canadian oil sands and deepwater drilling. 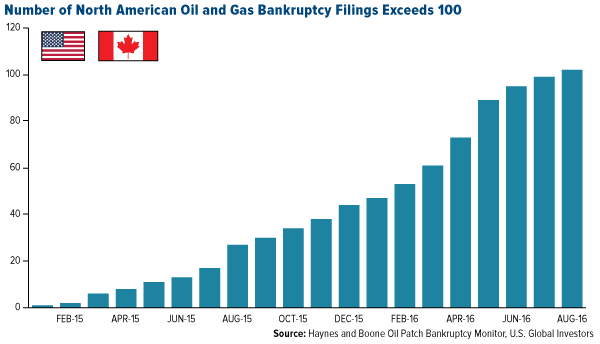 Since January 2015, more than 100 U.S. and Canadian producers have declared bankruptcy, representing a combined $67 billion in debt, according to Dallas law firm Haynes and Boone. To weather the low-price environment, global exploration spending has been slashed for two consecutive years. As Bloomberg reports, total investment in world oilfields stands at $450 billion, a significant 24 percent decline from last year. The International Energy Agency (IEA) expects the cost-cutting to extend into next year. This has driven new oil discoveries to their lowest point since 1947. It also underscores the need for industry consolidation. With exploration budgets down, major oil companies will rely on acquisitions to replace up to half of their reserves, according to energy consultancy firm Wood Mackenzie. When the airline industry was mired in bankruptcies a decade ago, we saw a huge wave of mergers and acquisitions, and we should expect to see the same in the oil patch. A few big oil and gas deals have come out of the price rout—Royal Dutch Shell’s acquisition of BG, worth $70 billion, is the largest by far—but more will likely take place in the near term. Antitrust officials prevented energy giants Halliburton and Baker Hughes from realizing their $35 billion deal, announced back in November 2014. Oil inventories might be brimming all over the globe, but demand remains strong and expected to swell alongside the global middle class. As I told you in June, India is expected to have the fastest growing demand for crude between now and 2040, replacing China. But don’t count the U.S. out. 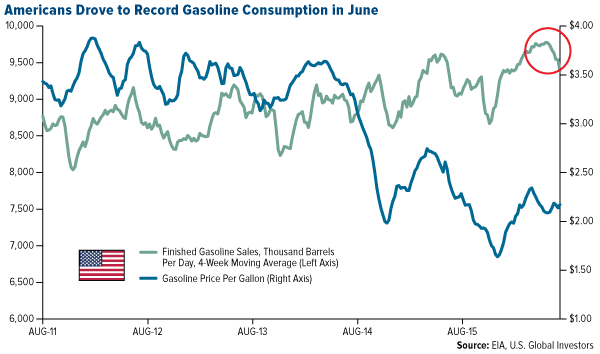 Even with fuel efficiency improving in automobiles, Americans burned through a massive 406 million gallons a day in June, the most recent month of data from the U.S. Energy Information Administration. This sets a new record, beating the previous one set in July 2007, soon before the recession. The record might be short-lived, however, once the July and August data are released. Low prices have emboldened many Americans to purchase vehicles with lower fuel efficiency such as trucks, vans and SUVs, which has been great for auto companies and lenders. People are also taking longer road trips. According to the Transportation Department, motorists logged 287.5 billion miles in July, the most ever for the busy summer travel month. That’s the equivalent of taking 3,000 round trips to the sun, which is what it feels like after all the flights I’ve taken recently. Holdings may change daily. Holdings are reported as of the most recent quarter-end. None of the securities mentioned in the article were held by any accounts managed by U.S. Global Investors as of 6/30/2016.